Helene Vosters is an artist, activist and scholar. A PhD candidate in Theatre and Performance Studies at York University, Helene’s performance and research focus is on the role of public commemoration practices in constructing narratives related to militarism, nationalism and violence. Helene has performed her embodied and durational memorial meditations Impact Afghanistan War; Unravel: A meditation on the warp and weft of militarism, and Haunting the Past’s Present: Falling for the forgotten (and not) dead of history throughout Canada, the U.S. and Europe. On Remembrance Day 2013 & 2014 she presented the public participatory memorial performance, Shot at Dawn: Embroidery for the forgotten dead of history, on the streets of Toronto. Helene has written articles that weave reflections from her embodied memorial meditations with critical analyses of Canada’s national commemoration practices. Her work has been published in academic journals—Canadian Theatre Review, Performance Research, Canadian Journal of Practice-Based Research in Theatre, and Frakicija—and book sections in Theatres of Affect, edited by Erin Hurley (Playwrights Canada Press, 2014); and Performing Objects and Theatrical Things, edited by Marlis Schweitzer and Joanne Zerdy (Palgrave, 2014). 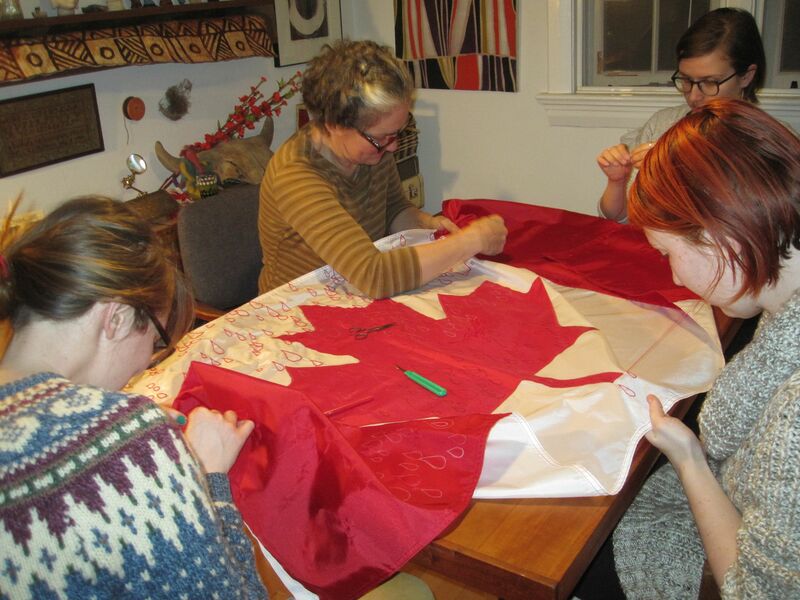 For the Flag of Tears participatory embroidery circles, Helene is thrilled to be joined by guest (textile and performance) artists—Thea Fitz-James, Paula John, and Melissa Lepp. Thea Fitz-James is part academic, part theatre practitioner. She holds a BA in theatre and journalism and a Masters in Theatre and Performance Studies. She a PhD student in Theatre and Performance Studies at York University, where she is exploring the political performance of textiles in contemporary society and performance. Paula John is a multi-disciplinary artist and scholar based in Toronto. She has been exhibiting her work (including photography, film, painting, printmaking, textiles, installation, and performance) since 2003. Some of the themes explored in her work include, gender, sexuality, feminism, and performance. Paula is currently a doctoral student in the Theatre and Performance Studies program at York University. M.e. Lepp is a creator whose practice aims to bridge the roles of artist, academic, activist, and educator. She recently completed her Master’s in Performance Studies, where she studied how queer bodies perform in/as public space. Hailing from Saskatchewan, M is fascinated with how her prairie identity informs her work.